The best way to learn about wine is to drink it. The more wines you try the sooner you will be able to find the ones you really like. Advice from friends, wine merchants and wine columnists can point you in the right direction, but only you can figure out what you like. So I make it a point to try wines which I know nothing about. That’s how I discovered Peju Province Winery about 10 years ago. It has been around since the 1980s, and I had driven past its distinctive building on Highway 29 in Napa Valley many times. One day I decided to check it out and discovered a real treat. Peju makes outstanding wines and the 2014 Peju Merlot ($41-43) is a great example. With expansive aromas of raspberry and blueberry and a deep garnet color in the glass, it is an inviting pour. Those aromas lead to complex flavors of raspberry, mocha and créme brûlée. The fruit and mellow tannins fill your mouth with flavor that changes with each sip. The word that came to mind as I sipped it was decadence. It is rich, full and elegant. I loved sipping the wine before dinner, but it really blossomed with food. The wine is 97 percent merlot, 2 percent petit verot and 1 percent cabernet sauvignon, grown in the Rutherford Estate vineyard and the Persephone vineyard in Pope Valley. After fermentation the wine spent 18 months in French oak (60 percent) and American oak (40 percent.) The barrels were 40 percent new. The wine should continue to improve in the bottle for another 5-6 years. The winery and its estate vineyard are in the midst of one of the most prized regions of Napa, the Rutherford Appellation. It’s a six square mile area that includes the vineyards of Caymus, Beaulieu, Robert Mondavi and Inglenook. Well-drained soil sees warm summer days and cool evening temperatures, sometimes as much as 40-50 degrees cooler than afternoon. This helps grapes develop and ripen evenly. The Peju merlot is a wonderful wine to try during October, otherwise known as Merlot month. I have been drinking Peju for years, ever since the serendipitous decision to check out their tasting room, so I have several of their wines in my cellar. I pulled out a 2008 Merlot to compare it to the current release and was blown away. I decanted the wine to let it breathe, and after about 20 minutes it practically exploded in flavor. Most of the tannins were gone and what was left was rich, ripe fruit, almost Port-like in its mouthfeel and taste. So if you have the patience you can keep this wine for many years and it will keep getting better. Winery: Tony Peju was studying film in Los Angeles when he met his future wife, Herta Behensky. She encouraged him to start a winery after finding 30 acres of land in Rutherford. He used a Mustang as down payment on the property. The land included a 1900-era house and vineyards, some of which were at least 60 years old, planted in cabernet sauvignon and French Colombard. Two of the most noticeable things about present-day Peju are its gardens and an iconic square tower with a vaguely Asian look. Tony Peju is responsible for both. Though designed by Southern California architect Calvin Straub in 1980-81, the idea was Tony’s even before he owned the winery. The tower was completed in 2003 and is the central feature on the Peju label. The 50-foot tower is one of the tallest in the Napa Valley. 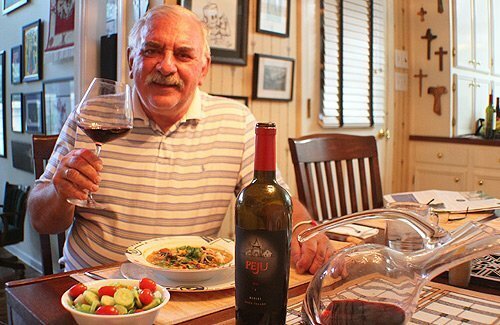 Tony Peju was born on the Caspian Sea and lived in France, England and then Los Angeles before creating his winery in 1982. He founded a successful nursery operation in Southern California in the 1970s before turning his attention to wine. The first wines were released in 1984, with the help of consultant Walter Schug. Two years later Peju cabernet sauvignon reserve won a double gold medal and best of region at the California state fair. The tasting room and gardens are among the most pleasant in Napa. The gardens are filled with impeccable lawns, well-shaped trees and gorgeous flowers everywhere. A little creek wanders through the area, which features fountains and the work of sculptor Welton Rotz. The Rutherford Estate vineyard is certified organic and the winery is a Napa County Green Winery. The family, including daughters Ariana and Lisa, is committed to sustainable farming. Solar panels on the winery roof provide 36 percent of the energy used by the winery. Goes with: We had this nice wine with southwestern chicken and vegetable soup, a wonderful fall/winter soup loaded with flavor. I made the soup to try to match flavors we had recently had in southern Utah, one of our stops on a recent three-week train trip. The smooth fruit flavors of the Peju Merlot nicely calmed the spiciness of the soup. With each sip the wine opened more and became even more mellow. It made for a memorable meal. The soup is loaded with shredded chicken, peppers, beans and southwestern spices. A sprinkling of chopped cilantro leaves gave the soup a little extra zip. This is a great dish to warm up the cool fall and winter evenings. The Peju Merlot also will pair well with many dishes, including roast duck, pork loin, barbecue chicken and lamb. Roast the poblano peppers in a broiler for 8-12 minutes until they start to blacken and the skin blisters. Turn them once or twice. Transfer to a paper bag and let steam to loosen skins. When cool enough to handle peel the poblanos, remove seeds and stem and coarsely chop. With the chicken you can boil 2-3 large breasts to make more broth, or sauté boneless breasts in a pan until lightly browned. Over medium heat sauté onions, bell peppers and garlic. Cook until they begin to soften, about 5-6 minutes. Stir in chili powder and cumin and cook about one minute. Stir in the broth, beans, tomatoes and the chopped poblanos. Bring to a boil and simmer until the vegetables are soft, about 15 minutes. Add the chicken and simmer for another 15 minutes. Serve over rice and top each bowl with a dash of lime juice and a tablespoon of cilantro.